With my jewelry party less than 3 weeks away, I have started to do some serious thinking about how exactly I plan on displaying all my stuff. Granted, I could easily just plop the stuff on a table and focus on the cupcakes and cocktails, but what fun is that? This whole process has proven to me that I am totally my mother, an interior designer's, daughter. 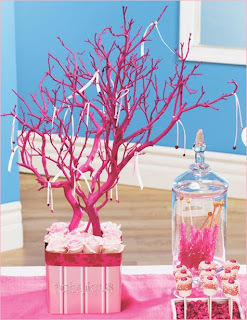 And admittedly a bit OCD about it, too ;) A few weeks ago I stumbled upon an awesome DIY article from the ever impressive Hostess with the Mostess on how to make this super chic Pink Tree centerpiece: Of course I went gaga and immediately told the Hubs to invest in the branch material used in the picture, called Manzanita branches (I figured I would let him figure it out since I had no clue where to get it!). Being the thrifty man that he is (to the point of bordering on cheap, gotta love it), he insisted that we didn't need to invest in the branch since the lemon tree in our back yard would work just as well. I was a bit hesitant at first (especially since we are renters!). There were, of course, lots of baby lemons left over. RIP little branch! After chopping down a good hunk of the tree, Hubs trimmed it down a bit and got rid of some of the bark. It was starting to take shape! Having searched high and low at Michael's, Home Depot, and Lowe's, the OCD in me finally found a shade of pink I could live with (i.e. just like the shade in the picture!). And so the spray painting began: We used a whole darn can of spray paint ($6) on this bad boy! Next, we cut some floral foam ($4) to fit into a clear square vase I had sitting around the house. After sticking the (newly dry) branch into the foam, I next had to decide on a color/print for the base (scrapbook paper, of course!). I measured the vase and cut the paper accordingly :) (and of course used Bead Up colors!) But we can't let the green foam show, now can we? Rather than investing on plastic-y looking fake flowers, I searched around the house for some kind of consistent color and theme for the base. I managed to find 5 different kinds of black flowers I use as hair clips and broaches. Done! Next to hang the jewelry to make sure it works: And Voila! $10 later, we have ourselves a fully functional tree jewelry display! I am sure if I had a baby blue wall like the Hostess with the Mostess example, it would look totally comparable! I kind of like the brown/black "clash" - who says you can't use these two "clashing" colors at the same time? Next week: DIY Jewelry Display - #$*& you, Oriental Trading Company! I can make that myself! Nice job! Personally I think it looks even better than the original. I love that you found an inspiration and were able to adapt it to your own needs. Kind of like when you take photos to inspire your jewelry line! Love love love your creative mind! Very nice! And kudos to your hubby for his help. That is super duper awesome! Would make a great focal point at craft fairs too. This is fabulous! i have a ton of trees on our property, so I need to get busy!! Awesome effort! This is a pretty low cost jewelry display for sure. Will link from my blog! Really beautiful and awesome, I really love the way you have presented, thanks for sharing with us such a beautiful post. Awesome Jewelry, Thanks for sharing with such a beautiful jewelry. keep it up. I've been looking for ways on how I can decorate the house with some of my old jewellery. Calgary has a lot of handicraft shops that sells ornaments, but I still want that shimmer in my house. If I could find sparkly ornaments in those shops, I'd get 'em. OH MY GOODNESS! I have to have this jewelry storage tree! I'm not sure I'd paint it pink, but this is one of the best ideas I've seen for keeping jewelry untangled and easily accessible. Thanks for sharing! I love it!